Back in June, I bought 10 shares of Darden restaurant chains. In November, the company spinned off FCPT as a REITs and I got 3 shares. 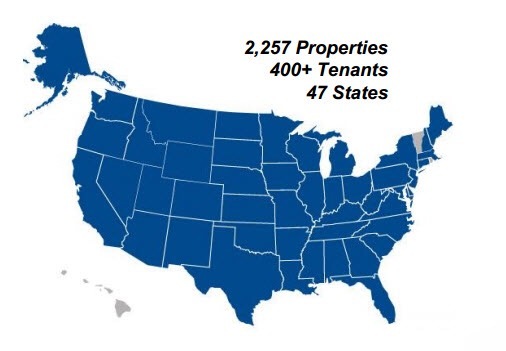 As a REITs, FCPT is required to have at least 75% of its business in real estate, and pay 90% of its profit. It doesn’t take long before I get the first dividend payout. On March 2nd, I received 2 payouts $6.49 and $17.86. The company gives me two options, either to trade in for stock or to receive cash dividend. I elected to have more shares and some cash. That increased my holding of FCPT to 4 shares. While it’s not nothing much, but this will increase my dividend by 25% :). REITs have moved up rather nicely, but the economic news have been great especially for the job market adding 22500 job last month, the unemployment rate is 4.9%. Many analyst predicted 2 rate increase instead this year, small increase, but still the fed might have the confidence to raise rate. What does it mean? Well short term, we might see value in REITs. I’m looking to add O back on to my portfolio and will add some others. We might also see the strengthening of the dollar. It might or might not effecting the oil price at this point because we don’t know for sure of Arab Saudi, Iran and Russia will decide to shake hand to reduce production. It might highly unlikely as Iran needs the market share. The oil price surge today of $41 might be short lived. My watch list for this year continue to be energy stocks. I’d have to be patience. 1. Sent the millitary protected oil rig into Vietnam’s sea, Philippines, Malaysia, and Japan . Making the undisputed island to disputed islands. They claimed all of the South China Sea as close as 2 miles off the mainland. *Internationa law said the country can claim 200 miles off the mainland, The rest is international water. 2. Pull the rig back. Arrest Viennese fisherman and capture fishing boats. 3. Build up the island, create navy base, and misle defend. 5. Disputed islands become undisputed islands, now parcels islands are totally militarized. I can’t say Barrack Obama or Angela Markel are weak. but under their ruler, China has grown exponentially. The US deficit with China is getting bigger, big brother is old and broke. That’s for sure. It’s always nice get get spinoff shares IMO. Congrats. It’s a great chain and investment to get into. I was taking my nieces and nephews to Olive Garden. The food and the service was great. All of us enjoyed our dishes, I think they finally turn the chains around. If we go into another recession, it might affect their business, McDonald’s might be a better choice for recession defensive. Congrats with the extra dividend payment. The Chinese development is worrying, particularly as an Australian (being the closest Western/English speaking country). I wonder if Donald Trump truly believes the things he’s saying, or if he’s just saying them to get grass root republican support. I guess we’ll see if he’s more civilised when he’s going against Hillary. Three weeks has gone by, Trump is losing momentum, people are now going for Tez Cruz, maybe Trump will not get the nomination, and he’ll run as the third party candidate causing the republican to lose the race. China is getting more dangerous now with their high demand of electricity and water, they are now blocking the river from upstream causing drought in the lower Mekong river to Laos and Vietnam. They built so many electrical dams and harvest all the water, with so much money they earn from production and trading surpluses over the past 15-30 years, they sure made great infrastructure investments. I don’t know how the US and the rest of the world can solve their trading deficit it with China problem as they can’t no longer complete with cheap products. Thanks for sharing! REITs are wonderful. I’m looking to beef up my portfolio with more quality REITs. Thanks for commenting, I haven’t heard from you for a long time, how have you been? I’d keep some REITs but their dividends are not qualified dividend, so I wouldn’t go big on REITs just because of high yield. Once I’m in retirement, i want to pay little or no taxes on dividend income of possible.